From Underground Toys! Celebrate a half-century of Doctor Who with these new mugs! 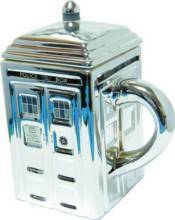 For the anniversary, choose the chrome ceramic mug of the TARDIS, complete with lid. Exterminate your morning coffee with the Dalek 3D mug. The TARDIS will appear when you use the Hidden TARDIS mug; as you drink your beverage down, more of the Doctor's timecraft will appear. Finally, the Pandorica mug may not harbor the greatest secret in the universe, but it will hold your coffee!